Emerging from the depths of Canada’s underground rap scene, Shawn Nova a.k.a. N0va steps to the fore with a memorable flow and a diamond vocabulary. N0va’s momentous style is fueled by his lifelong affair with music. His passion for melody began at 12 years old when he took up study of the guitar. Since the days of his youth, N0va has explored various musical genres and forms of art. His new album Checkmate is a living testimony of N0va’s genius and ascent to Hip-Hop’s throne. Checkmate consists of twelve flavorful tracks. The perfect ear-candy for press rewind addiction, N0va has put forth an urban saga that builds a bridge between rap generations who love lyricism versus those of the bounce era. The album begins with the track Own Up. Produced by JoeMay, this icebreaker comes with a smooth presentation and warm production. After N0va brags about “mastering everything in the Art of War and business,” he then goes on to prove it with a full plate of his special brand of verbal wizardry that follows. Manifesto is a killer track. N0va releases his vocal ammunition in an unorthodox cadence that is easy to follow and is also a clever way of bringing his audience in the studio with him. Now that’s moving the crowd! Manifesto graciously bleeds into another album gem titled Cutting Edge, a track that features the vocal expertise of Still Waters. Produced by Cecil, Cutting Edge pulls us into the dimension of Canada’s underworld. N0va and Still Waters put together a feast that true rap fans will often revisit. Checkmate’s production is very impressive. Though the album boasts an array of producers, Checkmate’s continuity has much to do with how each track can stand on its own while relating to other songs on the album, as if it was composed by the same producer. Never Forget Me and Shot Me Instead are two tracks that perfectly demonstrate this attribute. N0va comfortably switches gears of flow throughout Checkmate. His sing-rap style on No Sleep is nostalgic. The track is filled with witty bravado on bagging chicks. This is followed by N0va’s fierce lyrical delivery on Not The Same. N0va explores the realities of lyrical crime in 0 to 100. Appropriately, the succeeding track High and Dry is about facing our fears. The title track, Checkmate, comes with a spectacular beat that N0va has no problem gliding over as he hugs the track with rap and song. The track’s theme describes how to make our way in life despite the struggles we may face. N0va really goes in hard on Checkmate’s final two tracks It’s All Love and Cold Blooded. Messages of his ascent to hip-hop’s throne and what it takes to reach our goals come to life. 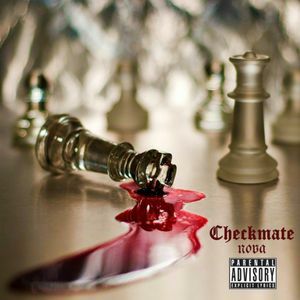 Checkmate is N0va’s masterpiece and a hip-hop classic album. The most refreshing part of it all is that lyrically N0va really does bring something new to the rap game. With Checkmate N0va is able to even out the scales of music and give his audience the tale of a winner!